AEROBICS is the easy, convenient way to stay in shape. And the more you do, the less you'll have to show for it. AEROBICS helps you to tone up your body, increase your endurance, and develop greater muscle coordination and flexibility. You'll find it's great way to feel good and look good! Just follow the figure on the screen as she goes through the exercises. You can choose one of the basic routines that focus on overall fitness. Or select a customized routine from 14 different programs that let you concentrate on specific body areas. All of the preprogrammed routines include all the exercise essentials: a warm-up, an aerobic series to get your heart pumping, stretches for perticular parts of your body, and a cool-down sequence. You can choose the degree of difficulty you're ready for. As you progress you can choose tougher - or longer - combinations. And AEROBICS has a variety of musical backgrounds that make your exercising even more fun. 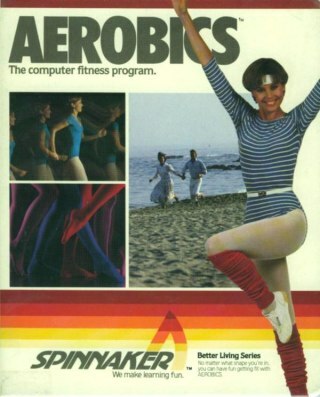 Best of all, you can do AEROBICS on your own schedule. In your own home. For as long or as little as you like. Whatever works for you.